My research interests comprise three main lines (paleoceanography, limnogeology and speleothems) that are interconnected by a common goal: the reconstruction of paleoclimate using geological archives of global change, including data from last glacial cycles but also last centuries. Since my phD, focused on the record of Saharan dust input in marine sediments from the NW African margin and the Western Mediterranean, I was fascinated on the different scales and mechanisms of past climate changes, particularly regarding to abrupt climate variability. My main speciality is on sedimentological and geochemical proxies but I am also working on the chronological framework of both lake cores and speleothems. Thus, in my group at the IPE-CSIC, we provide the scientific community with quantitative data on temperature and precipitation variability during abrupt climate changes based on the study of lake sediments (from Iberia and South America) and speleothems. That information, included in climate models, helps to get a better knowledge on the relationship between forcing factors and climatic response to abrupt climate change. 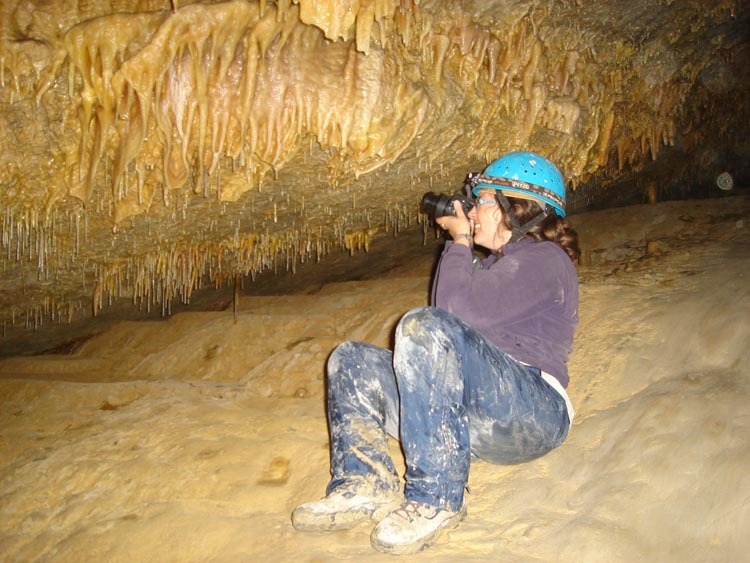 Currently, I am also working on incorporating new geological archives as paleoclimate records, such as the ice deposits found in Pyrenean caves. ≈ Bartolomé, M., Moreno, A., Sancho, C., Stoll, H.M., Cacho, I., Spötl, C., Belmonte, Á., Edwards, R.L., Cheng, H., Hellstrom, J.C. 2015. Hydrological change in Southern Europe responding to increasing North Atlantic overturning during Greenland Stadial 1. PNAS 112, 6568–6572. ≈ Moreno, A., Sancho, C., Bartolomé, M., Oliva-Urcia, B., Delgado-Huertas, A., Estrela, M.J., Corell, D., López-Moreno, J.I., Cacho, I. 2014a. Climate controls on rainfall isotopes and their effects on cave drip water and speleothem growth: the case of Molinos cave (Teruel, NE Spain). Climate Dynamics 43, 221–241. ≈ Moreno, A., Svensson, A., Brooks, S.J., Connor, S., Engels, S., Fletcher, W., Genty, D., Heiri, O., Labuhn, I., Perşoiu, A., Peyron, O., Sadori, L., Valero-Garcés, B., Wulf, S., Zanchetta, G. 2014b. A compilation of Western European terrestrial records 60–8 kaBP: towards an understanding of latitudinal climatic gradients. Quaternary Science Reviews 106, 167–185. ≈ Moreno, A., 2014. Palaeoclimate: Lags within the Younger Dryas. Nature Geosciences 7, 87–88. Moreno, A., González-Sampériz, P., Morellón, M., Valero-Garcés, B.L., Fletcher, W.J. 2012a. Northern Iberian abrupt climate change dynamics during the last glacial cycle: A view from lacustrine sediments. Quaternary Science Reviews 36, 139–153. ≈ Moreno, A., Pérez, A., Frigola, J., Nieto-Moreno, V., Rodrigo-Gámiz, M., Martrat, B., González-Sampériz, P., Morellón, M., Martín-Puertas, C., Corella, J.P., Belmonte, Á., Sancho, C., Cacho, I., Herrera, G., Canals, M., Grimalt, J.O., Jiménez-Espejo, F., Martínez-Ruiz, F., Vegas-Vilarrúbia, T., Valero-Garcés, B.L. 2012b. The Medieval Climate Anomaly in the Iberian Peninsula reconstructed from marine and lake records. Quaternary Science Reviews 43, 16–32. ≈ Moreno, A., Stoll, H.M., Jiménez-Sánchez, M., Cacho, I., Valero-Garcés, B., Ito, E., Edwards, L.R. 2010a. A speleothem record of rapid climatic shifts during last glacial period from Northern Iberian Peninsula. Global and Planetary Change 71, 218–231. ≈ Moreno, A., Valero-Garcés, B.L., Jiménez Sánchez, M., Domínguez, M.J., Mata, P., Navas, A., González-Sampériz, P., Stoll, H., Farias, P., Morellón, M., Corella, P., Rico, M. 2010b. The last deglaciation in the Picos de Europa National Park (Cantabrian Mountains, Northern Spain). Journal of Quaternary Science 25, 1076–1091.